On this blog page, author Mary C. Woolling posts an ongoing series of her essays showcasing the positives of life. New essays are added often. You are cordially invited to become a regular reader. Also, please feel free to share this site with your family and friends via the “Tell a Friend” link, located in the right-hand column below. Comments on Mary's essays are most welcome. Simply click on the “Post Comments” link appearing at the end of each essay, and share your thoughts. There’s something beautiful in every day. So true. And I venture to say, you don’t have to go far to find it. Not far at all. For many years, I found something (someone) beautiful sitting right beside me, while I worked at my computer – Mama Cat. I’m in the process of completing my taxes. Ugh! Most probably many of you are, too. This morning, I was looking through My Documents for a particular paper I needed and happened upon this photo of my beloved Mama Cat. 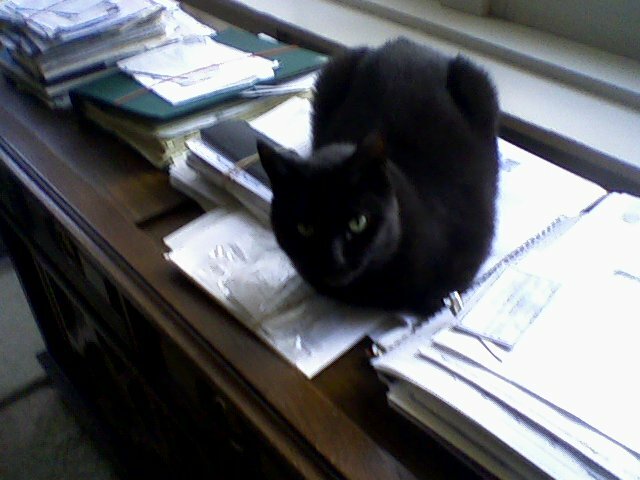 There she is, sitting on the stereo right beside my computer, helping to hold down my ever-growing piles of papers. This photo was taken just a few years ago. She looks hale and hearty, doesn’t she? Mama often sat there beside me. She was quiet and patient. Sometimes she’d reach across with her paw and gently pat my shoulder. She was such a comfort and great company. Mama Cat passed away a few weeks ago at the ripe old age of 18. She had started out life as a stray kitty, who, one morning 16 years ago, suddenly appeared in my yard, with six baby kittens in tow. She was thin and hungry and asking if she might stay with me. Of course, I immediately invited her into my house. And she immediately and permanently entered into my heart! The veterinarian estimated Mama was about two years old and from the fact that she could handily catch squirrels and rabbits and bring them up to my door, apparently thinking they’d be good for her kittens to eat, he surmised she had been on her own and struggling to survive for some time. Through the years, Mama Cat spent most of her days in the family room, sleeping on various couches and chairs. Amazingly, she never clawed or scratched or caused any trouble. It was almost as if she were on her best behavior, to ensure that she could always stay. Though she was quite independent, she enjoyed daily pats and love-up-on sessions. And she was very fond of my father, spending time in the evening perched on the arm of his chair, as he would watch television. As close as she could be to him. A lovely kitty. A perfect kitty. Something beautiful in my day every day for 16 years. And I didn’t have to look far to find her. What’s beautiful in your day today? Copyright © 2019 Mary C. Woolling All rights reserved. © 2007-2019 Communi-cate. All Rights Reserved. Site Development by Site Potion.